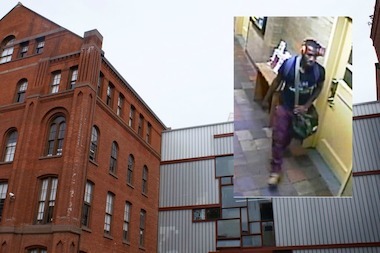 A man allegedly exposed himself to a woman working at Pratt Institute on Friday, August 8, 2014, at approximately 8:40 a.m.
CLINTON HILL — Police are looking for a man who allegedly exposed himself and masturbated in front of a worker in the chemistry building at Pratt Institute on Friday. The suspect was wearing red jeans, a black T-shirt, headphones and was carrying a green bag when he entered the building around 8:40 a.m. and exposed himself to the 46-year-old woman, who was cleaning the hallway, police said. The suspect then ran off, according to police. It is unclear whether the suspect was connected to the school and how he gained access to the building. Police were still searching for the man Monday morning. School officials did not immediately respond to a request for comment. Anyone with information can call Crime Stoppers at (800) 577-TIPS. All calls are confidential.